Our history begins with the de Lacy family in the 11th century. Hugh de Lacy (1020-1085) was a nobleman in Lassy, Normandy, 37km from Caen. His two sons Walter (1038-1085) and Ilbert (1045-1093) came over with William the Conqueror and fought at the Battle of Hastings. For their support King William gave them lands; Walter had land in Herefordshire and Shropshire and Ilbert land in West Yorkshire and Blackburnshire. 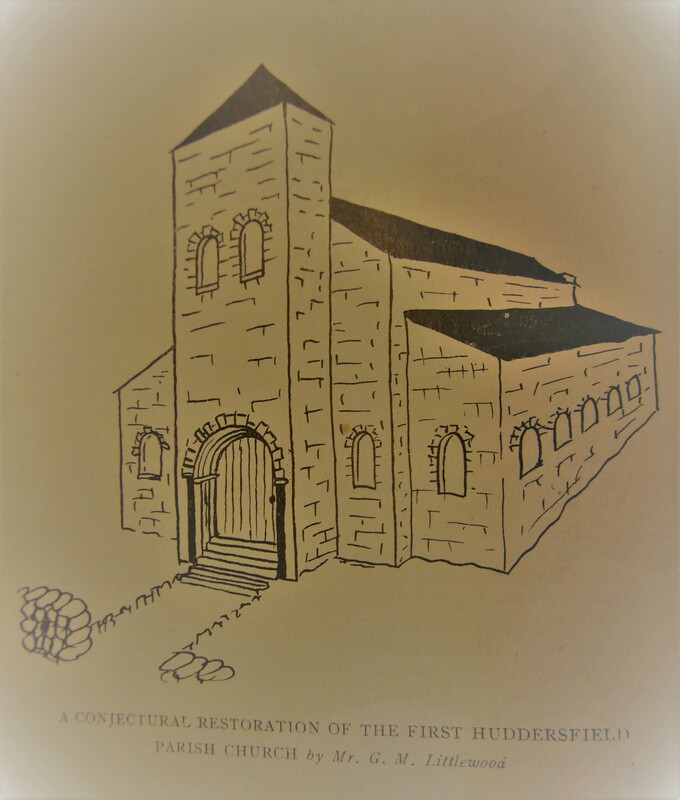 The story of the Parish Church is that Walter de Lacy was travelling by horse between Huddersfield and Halifax (they owned a property in Almondbury) when he was thrown from his horse into a swampy marsh. Fearing for his life, he vowed that if he were spared, he would found a church at Huddersfield. Walter lived and kept his promise and the church was built around 1090-1100. The date could not be earlier as the Doomsday book of 1085 records no church in “Odersfelt”. There are some inconsistencies with this story. Walter died in 1085, and the church was allegedly built after the Doomsday book. Walter was described in the story as the second son of Ilbert de lacy. Ilbert had three offspring; a daughter Matilda (b1068), a son Robert (b1070, d after 1102 but before 1129) and Hugh (b1082-circa 1139). I leave you to wonder, but nevertheless the church was built. Ilbert became the First Baron of Pontefract. His second child, Robert was Second Baron of Pontefract and he founded Pontefract Priory in 1090. Robert de Lacy (also known as Robert de Pontefract) had several offspring; Albreda, Robert who was killed in 1138 in the Battle of the Standard, Ilbert II 3rd Baron of Pontefract, Henry de Lacy who became 4th Baron of Pontefract. In 1121, Robert, Second Baron of Pontefract, was banished essentially for picking the wrong friends, by King Henry I (1100-1135) and all of his lands, including the Manor of Huddersfield were given to Hugh de Laval, who in turn gave the advowson (patronage and thithe rights) to the Augustinian Order at Nostell Priory. The de Lacy family regained favour and in 1136 the lands were restored to Ilbert de Lacy II. In 1141 when Ilbert II died his brother Henry inherited, and it is he who gave lands at Barnoldswick to the Mother House of the Cistercian Order at Fountains Abbey to establish a Daughter House. The land proved unsuitable and in 1152 the monks moved to a new site at Kirkstall (Kirkstall Abbey). The list of vicars appears in full in the West porch of the present building. During the years 1503 – 6 the church had been rebuilt in the ‘Perpendicular’ style. The Parish Church had at least two chantry chapels possibly at some distance from the church. Masses would have been said here for the dead, before the reformation. We believe one such chapel to have existed at Bay Hall in Birkby, Huddersfield. (iii) build the tower much higher to 120 feet. The cost escalated to £10,000. The new church was consecrated on 27 October 1836. Unfortunately, many of the stones were laid ‘the wrong way round’ and, as a result, have weathered very badly in years since. After entering from the west porch, where the plaque recording former Vicars is placed, proceed down the aisle. You can see the Constable staves placed in holders in the middle of some of the pews. Each parish was responsible for providing constables for the town, before the founding of a modern police force. On the north wall you see a plaque in memory of the Revd Henry Venn. To the east stands the Conacher organ pipes of 1908, restored by Philip Wood of Huddersfield in 1984. In the choir the stall ends are of note and may come from the second church. Looking toward the sanctuary, you can see the main beauty of the church, the east window and baldachino, both designed by Sir Ninian Comper in memory of the fallen of the first world war. The lower part of the window shows a depiction of the risen Jesus Christ, and on his right St Peter, our patron saint; the other figures are St Mark, St Paul and St Aidan, all representing former daughter churches (now closed). The upper lights portray Christ in majesty, flanked by St Michael and St George. The Lady Chapel is in the south aisle, designed in this form in 1944 as a memorial to former Vicar Canon Leeper. The carved screen and small credence table are the work of Robert Thompson of Kilburn with his signature carved mice. The Arms of the Ramsden family and of Archbishop Vernon are depicted in the glass above the altar. There is new glass too, added here and above the west window at the end of the 20th century. The Elizabethan font to the west is dated 1570, with the royal cipher ER and the arms of England and France quartered. Its cover is supposed to be that given by Joshua Brooke of New House in 1640. The carved panelling of the gallery above is probably from the second church. The choir vestry was added in 1879, balancing the similar octagonal vestry to the north. There are some interesting ‘corbels’ (forming the labels to the hood moulds above the windows). Jesus Christ and his mother Mary are depicted, along with Benjamin Disraeli and a former Bishop of Ripon. The former graveyard on the north side was taken into the care of the Local Authority in 1952. It is hoped that renovation work will soon be carried out to restore this area as a place of beauty and peace for the people of Huddersfield. The church was re-ordered in the late 1980s in line with liturgical reform and changes in worship. The main alteration was the extension of the floor to enable a free standing nave altar and a semi-circular area around it where worshippers kneel to receive communion. The furnishings of the chancel can be moved to allow drama or recitals to take place. The crypt beneath the church has been excavated. Part of this is now taken up with office space for the church and part is leased to the very popular Key’s Restaurant and Coffee House. 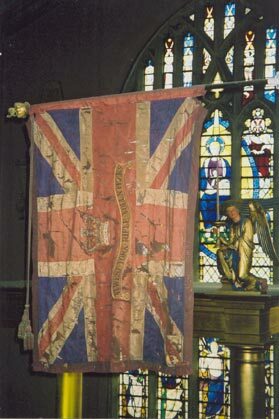 The Colours were taken down, to be stored in a specially commissioned oak cabinet, against the north wall of the church on Wednesday 16 April 2008. “For forty-seven years these Colours have symbolised something very real, true and important – courage, service, loyalty and chivalry. But what is more important, they have represented faith, hope and love. Colours are the very soul of a regiment.